Welcome back to this multi-part blog series on vRealize Operations 7.5, where I will provide a technical overview of all the new and improved features in this release. The first part covered improvements to Workload Optimization, with new vSAN capability and better visibility into Business Intent policy violations and host group workload. In this second part, I will cover everything related to the second pillar of Self-Driving Operations – Cost Optimization. 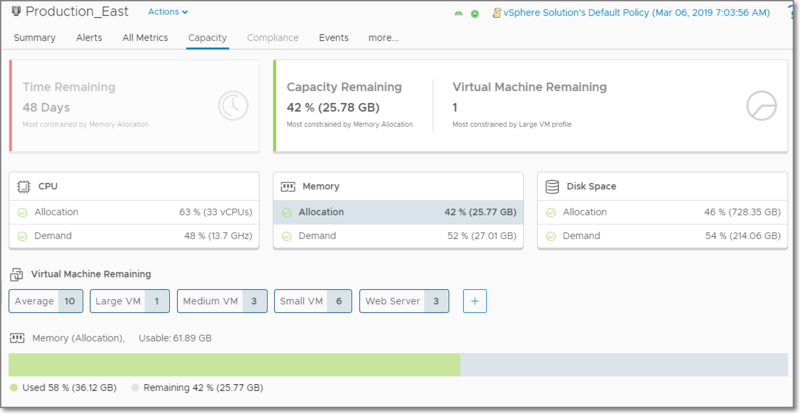 If you are not familiar with how cost and capacity work in vRealize Operations, visit vrealize.vmware.com to get up to speed with videos and guided demos. You can also check out our recently updated Hands-on-Labs which covers everything you need to know about vRealize Operations in version 7.0. These aren’t the only reasons but the three we’ve heard most. 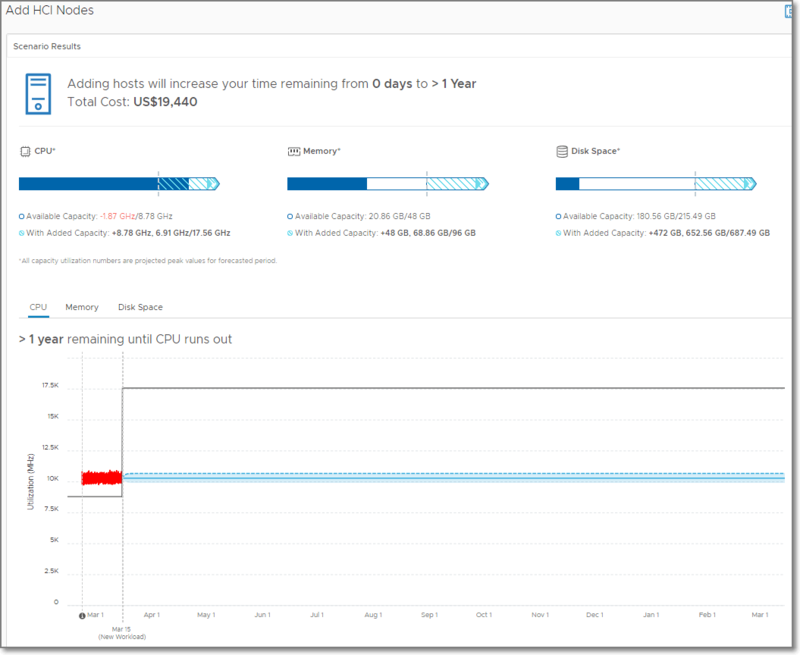 So, here’s good news: If you’ve been waiting to upgrade from vRealize Operations 6.x because you need allocation model for capacity planning the wait is over! By default, capacity will use the demand model but if you need allocation model, you can easily activate it in policy. As you can see below, you simply unlock Allocation Model in your policy for cluster objects and set your overcommit ratios. 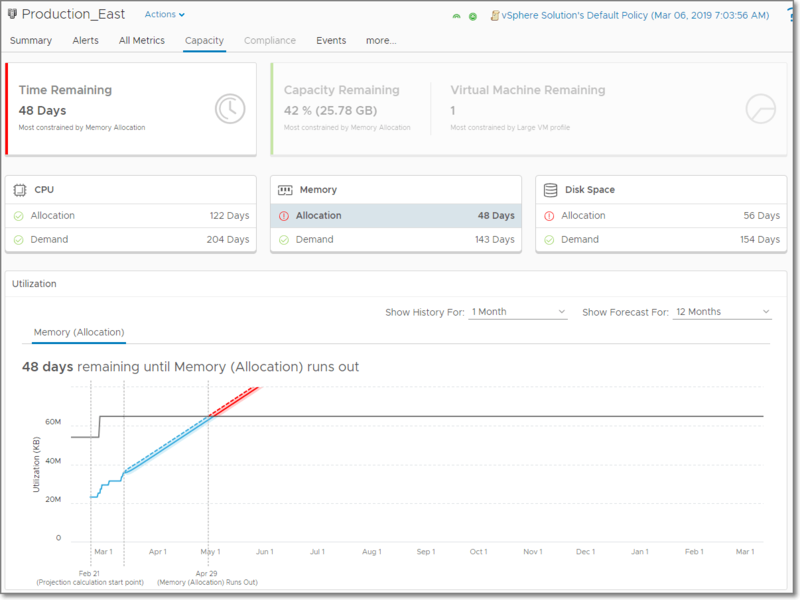 That’s it, allocation will now appear alongside demand in capacity views throughout vRealize Operations 7.5. There is also a new “Capacity Allocation Overview Dashboard” provided that gives you full details of resource usage by allocation. Notice that the Time Remaining card and Utilization card are based on the most constrained resource and capacity model. In this case, memory by allocation. Also, with allocation model enabled, you can see both demand and allocation time remaining for CPU, memory and disk space. Clicking on the Capacity Remaining card exposes some other great news – custom virtual machine profiles are back! These are great, high level visualizations of how many virtual machines will fit within a cluster given an “average” virtual machine for the cluster along with any other profiles you wish to create. You can easily add, edit or remove custom profiles with the Custom Profiles manager. It allows you to set profiles for CPU, memory or disk space using either demand or allocation for each. Also, Custom Profiles can be unique for each cluster, using policies to assign custom profiles as needed. This was another frequent request from our customers, and we think you’ll agree, we delivered in a big way! That’s right, vRealize Operations 7.5 will now provide you a list of orphaned disk files on your datastores so you can investigate and remove them to reclaim disk space. Another customer favorite and a huge time saver for administrators. What are orphaned disks? Basically, virtual machine disk files that are no longer attached to a virtual machine (for example, a VM was removed from inventory but not deleted from disk). They can be a problem because they don’t show up in vCenter inventory and thus can create disk space constraints with no clear understanding of where the space is being used. Now you can see a list of orphaned disks on the Reclaim page. You can see the cost associated with the orphaned disks, as well as the length of time the disk has been untouched (the “last modification age”). You can export the list to CSV for further review and reference during cleanup. Also, you can exclude any orphaned disks found from the Reclaim page in case they are being kept for a specific reason (such as archival, legal or compliance needs). What If There Were More What-If Scenarios? 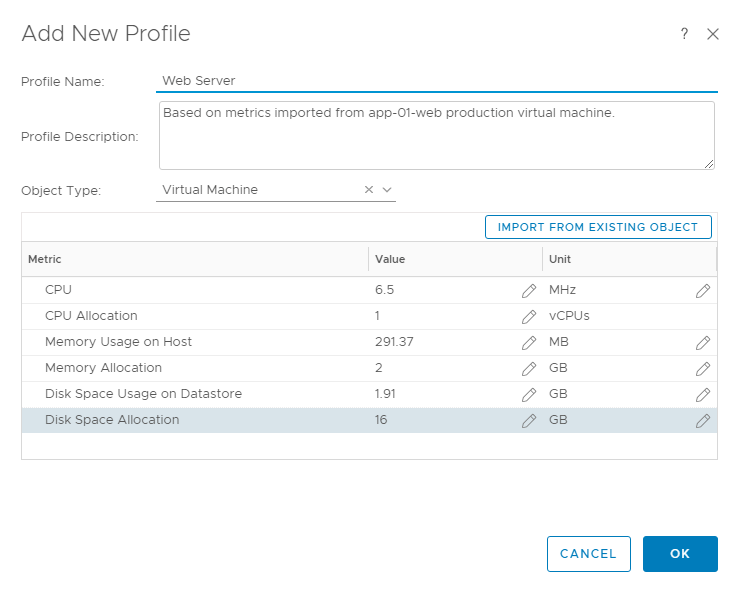 With vRealize Operations 7.5 you can find out with new What-If scenarios for removing virtual machines, removing hosts, adding HCI nodes and expanded coverage of migration planning scenarios for practically any cloud in existence, or any new clouds for that matter. For both Workload Planning and Physical Infrastructure Planning, the benefits are somewhat obvious. But when you consider that 7.5 now also supports stacking of saved scenarios this creates a lot of new capability for capacity planning. For example, a hardware refresh. During a refresh of ESXi hosts, you will be removing old hardware and replacing it with new hardware. In the screenshot below, not only am I refreshing hardware but also onboarding a new application and retiring an old one. Combining the four scenarios gives me a visualization of the aggregate impact on my SDDC resources. 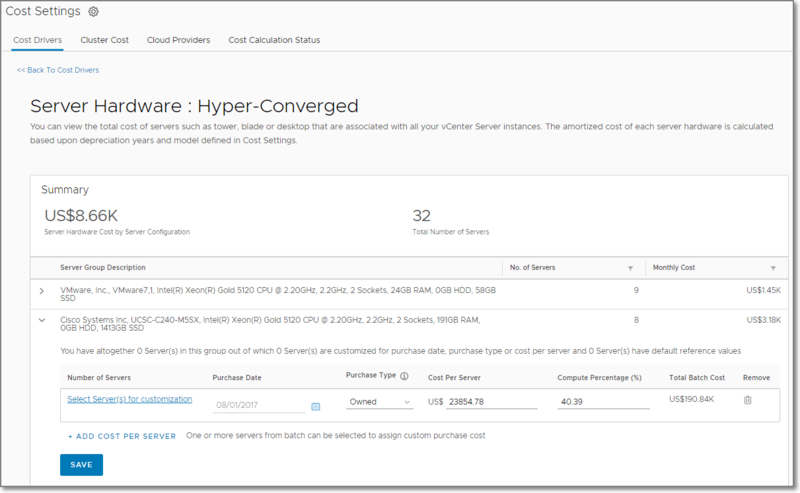 The Hyperconverged Infrastructure What-If scenarios allow you to model expanding vSAN clusters, to understand the cost, amount of additional resources available in a vSAN cluster and how that will address any projected capacity shortfalls. Compute and storage planning in one, easy to use tool! 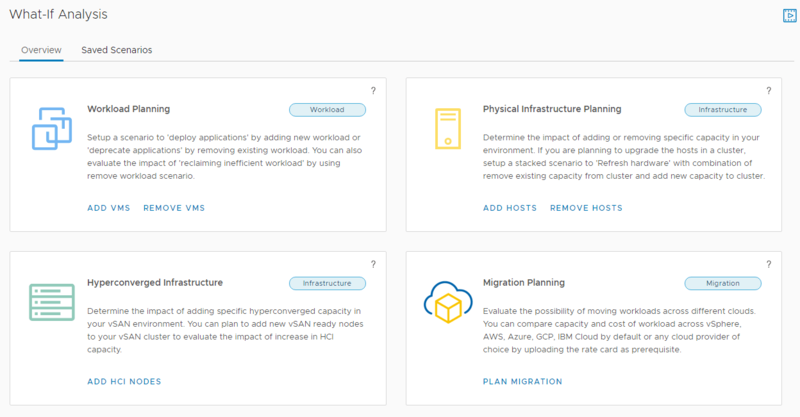 Finally, rounding out the new and improved What-If Scenarios is a big improvement in Migration Planning, with updated VMware Cloud on AWS options, additional public cloud providers (Microsoft Azure, Google Cloud Platform, IBM Cloud and of course Amazon Web Services) and the ability to add any cloud provider, such as a VMware Cloud Provider by uploading a rate card template with the provider’s published rates or your own negotiated rates with that provider. This makes it incredibly easy to see which options are the most cost effective based on a selection of providers and available regions. Instance sizes for the virtual machines are also listed with their associated cost. There are several new and improved costing features in the 7.5 release. Let me dive right in and summarize them for you. First up in the ability to specify individual server costs in the Cost Drivers. Customers told us they liked being able to set their own costs but needed to be more granular as not all hardware is purchased at the same time or under the same contract or even from the same vendor. This improvement allows you to set server costs individually or in groups to specify purchase dates, cost per server and purchase type (such as “owned” or “leased”) for more accurate cost tracking and allocation. And if you’re using hyper-converged servers? No problem, you can now set costs for those as well and set the amount of cost allocated to compute (versus the storage) as a part of the cost driver. Another improvement in Cost Settings is the ability to include ELA costs into the License Cost Driver. Also, you can now add a total monthly “lump sum” cost for Labor, Maintenance and Facilities. As you can see, a lot of effort went into improving Capacity Optimization features in vRealize Operations 7.5! But don’t take my word for it, download a trial of vRealize Operations 7.5 and try it out! You can also find more demos and videos on vrealize.vmware.com. Be sure to check out the next blog in this series where I will cover what’s new in 7.5 in Troubleshooting, including big news for Application Monitoring, native ServiceNow integration, Super Metrics on steroids and very cool relationship and correlation tools and more! 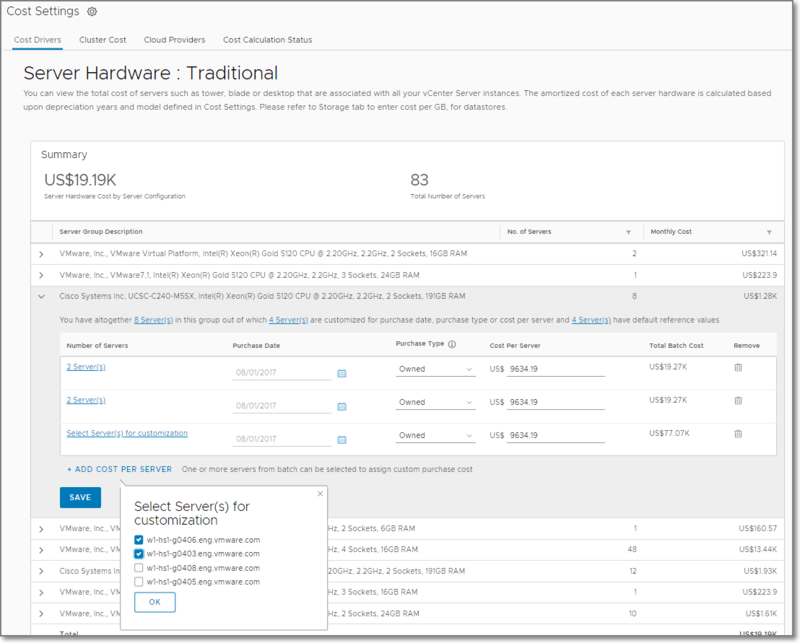 The post What’s New in vRealize Operations 7.5? A Technical Overview, Part 2 appeared first on VMware Cloud Management.